I’m dreading next week when students return to school. Traffic in the mornings and afternoons is going to get worse. The bus I take to work is nearly empty during the summer months but when school is in session, it wouldn’t be out of the ordinary if I had to stand every single time until next May. I’m sure parents are glad to ship out their kids back to school but I’m not looking forward to it. MADDEN 18 IS OUT NOW! On Friday, Madden 18 went into wide release, the latest installment of the long running football video game franchise. I had a very small part in its development. I primarily worked on a system that is new to the Frostbite engine that allows a game to updated and patched while the game is still running. Madden 18 uses this system to update audio commentary and other data. The cool thing is this can be done without involving Microsoft or Sony. A traditional game patch has to go through testing and approval by the platform owners and the patch is stored on their servers. With this new system, we bypass all of this. The update/patch is stored on EA servers. We can update the game daily if need be (though that would be a crazy cadence). To be clear, I didn’t do this all on my own. It was a real team effort and I had a very small part in this. I didn’t expect to have a game credit for this calendar year but I’m listed in the main credits for Madden 18, which I’m kinda embarrassed about. I’m not sure I did enough work to warrant that but I didn’t want to make a big deal about it. Anyways, check out the game if you get a chance! Posted on August 29, 2017 Leave a comment on MADDEN 18 IS OUT NOW! I made my first cheesecake on Sunday. This was possible because I bought my very first mixer, one that has a stand no less, on the weekend. It was a great deal at $85 when it retails close to $200 in some stores and online. It also is red metal and kinda looks like if Tony Stark made an Iron Man mixer. I’m not the biggest cheesecake fan in the world but the recipe I read seemed easy enough and more importantly, it really did require an electric mixer for this to be a feasible task. It called for four packages of cream cheese to be mixed until smooth and without my mixer, it would have been an arduous process to do it by hand. My arm and hand would have been just exhausted if I had to do it manually. I also had to buy a springform pan which I’d never used before. It was a great learning exercise overall. I also learned something about cheesecakes that I never even knew was an issue. 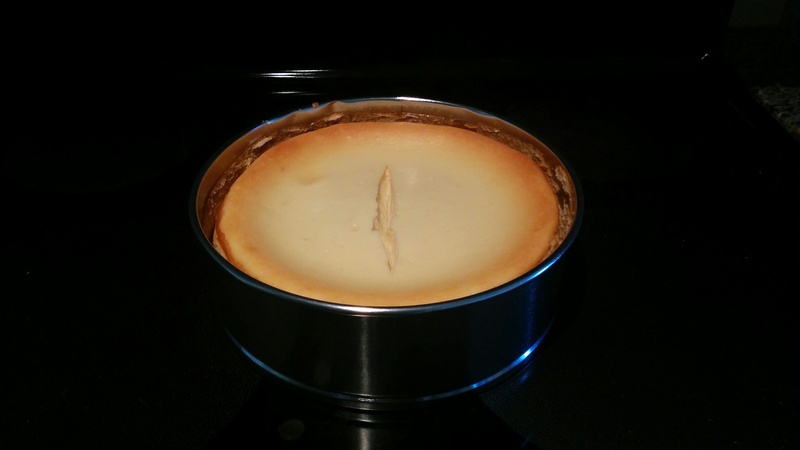 Apparently, cheesecakes can crack if you don’t adhere to the recipe exactly or prepare it wrong. It has no bearing on how it tastes but it’s more of an aesthetics thing. 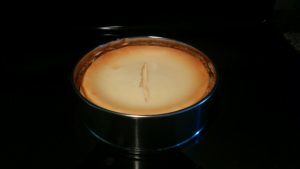 Despite taking most of the precautions, my cheesecake a single crack running down the center. I didn’t care all that much. So you’re probably wondering how it turned out in terms of taste. I was honestly a bit surprised to discover I made an awesome tasting first cheesecake. It actually turned out great. I prefer my cheesecakes to be creamy and smooth, rather than cake-like and dry. This one was exactly that. I was expecting it to be a bit of a disappointment but it was difficult for me to just stick to one piece a day. Knowing what I put into it, I can say this thing is packed with sugar, fat, calories, carbs and everything else that makes something taste great but is horrible for your body. I brought a slice to work for a co-worker and he said it was amazingly good and better than his Mom’s cheesecake. What an endorsement! There’s still three-quarters of it left and I’m not going to eat it all, I just can’t. Perhaps I’ll bring more of it to work. In any case, I’m looking forward to making more stuff with my mixer. Last week I bought nearly a pound of blueberries from the grocery store. They looked like they were freshly picked and of good quality. The next day I went to wash a bunch of them before eating. As I poured some of them into a large bowl for cleansing, I noticed two of the blueberries had some mold on them, white and fuzzy. That is never a good sign. I picked those blueberries out and threw them away. I also threw away the berries surrounding the moldy ones. Undeterred, I washed the rest as thoroughly as I could and drained them. A little thing I like to do is to place the freshly washed blueberries into the freezer for about 10-15 minutes to firm them up again and get them nice and cold. It’s quite refreshing on a summer day. After taking them out of the fridge, I ate a fair amount of blueberries. They tasted fine. That night as I slept, I was awoken with stomach pains. I tried to continue to sleep and that was somewhat successful but the pains continued until early morning. I finally got up and pooped. I felt better after that. I went back to bed and then woke up for realz and then went to work. Apparently, I wasn’t done with the blueberry poops just yet, as I had to poop again at work with some urgency. That seemed to do the trick as most of the blueberries were now out of me. That evening, after returning home from work, I had a decision to make. I had lots of the blueberries left from the package but it was clear that the ones I ate had made me sick. Should I risk it and continue eating them? I love blueberries but I hate having to poop uncontrollably. What if it was just one rogue blueberry that made me sick? What if the rest were fine? What if there were other poopy blueberries awaiting me though? I decided it was too risky. I’ve had so many previous experiences with gastrointestinal maladies caused by bad food that I didn’t want to take any chances. I dumped the rest of the blueberries in my compost. It’s never good to waste food but when that food could potentially my life a poopy hell, I’m ok with throwing it out. You might be aware that there is going to be a total (depending on where you live) solar eclipse on Monday morning. In Vancouver, the eclipse will be about 80%. This is a pretty important astronomical event yet I haven’t done a single thing to prepare for it. A co-worker of mine is in Oregon where the eclipse will be total. He took a day off from work to experience this. Two other people I know are also in Oregon for the eclipse. I didn’t even build a small pinhole project for it. Some people go their whole lives without having a chance to see a solar eclipse. I’ll probably will be commuting when it starts. I’ll hopefully be at work when it’s at the maximum of totality for this region. Perhaps someone will lend me their projector? Last night, shortly before I wanted to go to bed, I decided to grab a few corn chips from a bag that I had opened earlier. It was supposed to be a tiny snack to keep me from feeling hungry as I tried to sleep. In a display of excellence, I managed to get exactly two chips in my mouth in just the right orientation and position so that when I bit down, the chips were able to pinch the inside of my cheek. I experienced a sharp lightning bolt of pain before feeling the chips finally break into pieces and release my cheek flesh. How the hell is anyone this clumsy? Still smarting from the pain, I stopped eating and drank some water. I was finishing up watching a YouTube video and when it ended, I moved my tongue over the area that had been pinched. I didn’t feel too much discomfort but what I definitely did feel was a bump, a pretty large one. I got up and went into my bathroom to look at a mirror to figure out what was going on in my mouth. The corn chip pinch had caused a sizable blood blister to appear. At this point, I had to chuckle at my amazing ability to get injured in such a stupid fashion. Anyone can just bite their own tongue or the inside of their mouth with their teeth but no, I managed to injure myself using two corn chips as weapons. I wanted to pop the blood blister immediately but I then vaguely recalled reading that wasn’t the recommended action. Using everyone’s favourite doctor, I consulted the Internet and the prevailing advice was to leave it. The blister wasn’t causing me any pain so I left it. I was able to brush my teeth without it interfering. I went to bed hoping it wouldn’t pop while I slept. When I woke up, I went to look at the blister in the mirror and it was still there, the same size as before. Because it didn’t hurt or get in the way of eating, I basically went about my day normally. I even forgot about it at one point. Once in a while, I’d slide my tongue over it just to see if it was there. I came home from work, ate dinner, and had a normal evening. About an hour ago, I went to look at it in the mirror again. It was gone. If it popped, I didn’t taste or feel it. You’d think I’d have tasted it or noticed a ball of blood exploding into my mouth but I did not. Maybe it just healed during the day and it went away on its own without popping? I can’t be sure. I’m a bit concerned it did pop and infection might be a possibility. I swapped it with rubbing alcohol and it didn’t really hurt at all, so I’m guessing there are no exposed nerves. I guess that’s a good sign? Anyways, I’m super tired and I want to get some sleep. Don’t be a moron and eat corn chips improperly like I did. About an hour ago I tried to log into my WordPress to write a post. I couldn’t event get the log-in screen to come up. There was an error message say something about the site administrators not allowing such an action. I’d never seen that before. I went to my hosting company’s web site to get some support. They have live support 24/7 which is convenient. I started up a chat window and it took the support person about fifteen minutes to look into my specific site to see what the issue was. Apparently they had disabled the log-in for my WordPress installation because of security concerns. This of course alarmed me so I asked for more details. I was told that it was nothing to do with my site specifically but they had disabled many such sites on their shared hosting because of possible DDoS attacks. They re-enabled my site log-in, which is why you’re reading this now. Alright, well that was fun.